Design professionals are sometimes on an insatiable search for the perfect tool that will make us all the more effective at our work, expanding our creative horizons in improved form and reduced time. A CAD solution would be a system that provides the flexibility to handle several different design situations, yet enables fast and optimal changes easily. I think I may have found just such a system in IronCAD. As a CAD/CAM veteran, I have watched the birth, growth, and in some cases the death of software companies for our design world. Winners are those whose CAD products become popular due to their ability to apply professional solutions suitable to various industries. CAD software that has existed for a long time and did not think about modern principles at the beginning may have had to adapt, not always successfully. 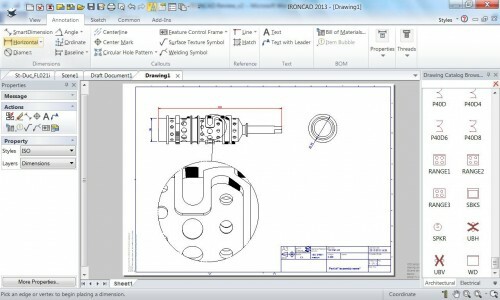 My task in this review of IronCAD then is to use my experience to survey what in my opinion are the concepts and differentiating points from other CAD systems, without going into the details of commands that are common to similar MCAD systems. With the various CAD technologies available today having their benefits and limitations, it is an interesting surprise that IronCAD manages to incorporate the best of many technologies into one design methodology that they called Innovative Design. To understand the product environment that I will be writing about, it makes sense to give an overview of all the modules found in the IronCAD suite of software. 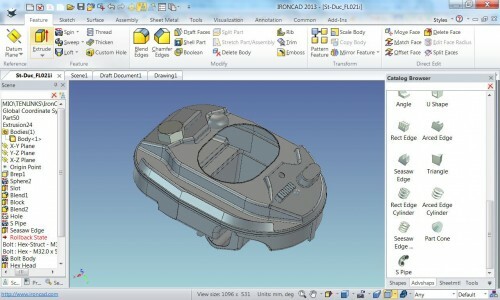 IronCAD is the core product for creating 3D models and 2D drawings. It combines direct editing and history-based parametric environments, with both ACIS and Parasolid kernels. Much of the editing can be done with drag-and-drop 3D intelligent parts and features, manipulated by the TriBall positioning utility interface. INOVATE can be used standalone or to complement any MCAD package with a product lifecycle capabilities from conception to completion in 3D. 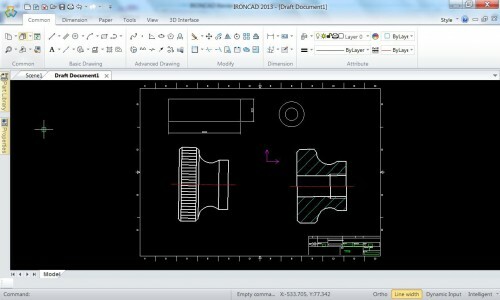 DRAFT is a standalone 2D mechanical drafting program. While it works in 2D, it is able to also view, reference, analyze, assemble, and render 3D models that can be detailed associatively in the 2D environment. COMPOSE is not only a viewer that checks 3D models with measurements, renderings, and animations, but it can also be used to configure parts and assemblies of your company products with intelligent positioning and orientation capabilities. It is free. 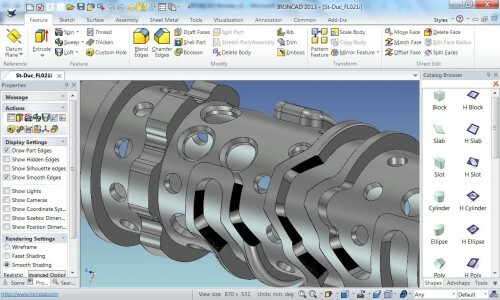 TRANS is the translation add-on that offers additional formats like CATIA V4 and V5, Pro/E (a.k.a. Creo), NX, SolidWorks, and Inventor (IRONCAD, INOVATE, and IRONCAD DRAFT include standard solid formats such as ACIS, PARASOLID, STEP and IGES, and most graphical formats. IRONCAD COMPOSE Translator options will include all the solid formats (basic graphical formats and IronCAD’s standard file format are included in the base product) . 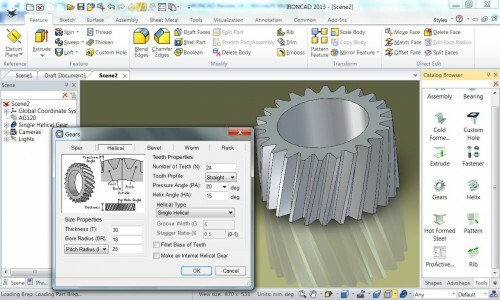 After I installed and launched IronCAD, I found it to have a very intuitive and user-friendly environment using menus, dialog boxes, and icons similar to those of other CAD programs. When there are too many windows on the same screen, then it might make sense to use a higher resolution monitor or add a second one. The 3D environment covers areas like 3D detail design, 3D visualization, realistic rendering, and animations. The characteristic that I want to emphasize is that always it tries to present options commensurate with the design operation currently underway, and so the creative process is fluid – allowing me to think more about the 3D design and less on the functions. The 2D environment is dedicated to drafting detail layouts. These two environments brought to the process at the time I start new documents. A dialog box displays these options to select: Scene, Drawing, or CAXA Draft. Let me describe to you them in order. Scene is dedicated to 3D design. 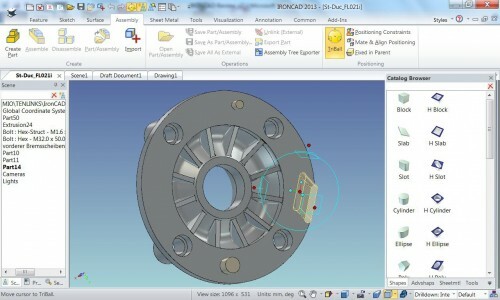 Unlike other MCAD systems, IronCAD makes it possible to create single or multiple parts and/or assemblies in the same scene. It uses either the ACIS or Parasolid modeling kernel, which ensures precise and error-free import/export of native and neutral CAD files and the system can leverage both kernels modeling capabilities to achieve desired design modifications where a single kernel alone may simply fail. I should also note that the scene environment provides a good variety of environmental effects for more realistic-looking models (see figure 1). IronCAD’s Scene environment has similarities with the organization of some high-end MCAD modelers, which conceptual are containers for all components – features, parts, assemblies, imported parts, renderings, and animations. I verified the flexibility of IronCAD’s approach in that I could decide which scene structure to use at any stage of my design; it’s possible to keep all the components in a single scene. Alternatively, I can break out individual components into individual scene files, which then allows me to reference the same component in multiple files. As is typical in other MCAD packages, IronCAD allows changes to be edited as I need them. For instance, the assembly structure can be rearranged and reordered during the design process using the Scene Browser. One other item I want to highlight about assemblies: when I perform cut operations on an assembly, IronCAD also cut the parts of the assembly. This feature makes me very productive. IronCAD has two drafting environment, named Drawing and CAXA Draft. The Drawing environment is where I work when needing to produce 2D drawings. I found it good enough to create all versions of drawings, for it supports associative views of existing 3D parts and assemblies, along with any annotation required, such as dimensions and notes. IronCAD also places BOMs, symbols, blocks, layers, and frames (see figure 2). The other 2D detailing environment is the CAXA DRAFT environment (see figure 3). It consists of a 2D design system that is nearly as powerful as AutoCAD, the most recognized 2D CAD package in the industry, complete with a familiar interface. This environment allows me to use the full capabilities of a standalone 2D drafting application, edit legacy DWG/DXF files, and to employ tools to detail 3D data from IronCAD. I want to dwell on CAXA DRAFT a bit, because I think it is a very usable system, especially for designers who have 2D drawings and need to use them for generating 3D models. (Many well-known MCAD system lack such a built-in facility.) The design data layout is accomplished by a 3D interface that allowing detailing 3D designs using standard views, section views, detail views, and many others. They keep the full association to the 3D scene data and, in addition, it’s possible to create a bill of material (BOM). Well, you may find the title of this section curious, but after spending some time with IronCAD, I found it flexible in the way I conduct the design process. As designers, we spent years getting experienced in way a particular CAD system operates. Flexibility, then, is something we could consider as revolutionary – or at least very interesting. IronCAD achieves its flexibility by combining two design environments that are different. One IronCAD calls “innovative design” (i.e., feature history based and direct editing mixed automatically within the structure of a single part), and the other “structured design,” the conventional history-based structure which also supports direct editing as a feature in the history order. The combination allows us to choose which process is most appropriate for the part we are designing at the individual part level! The Innovative Design side delivers the flexibility that allows us to manipulate parts directly without thinking about their history or constraints, yet keeps feature design information. This is critical when designing conceptual models. Another useful aspect to IronCAD’s mixed feature environment is when we work on imported data containing no feature information, and can add parts with features (see figure 4). Thus, we can directly edit geometry regardless of the underlying definition. The other side is the conventional 3D modeling environment, which IronCAD calls “Structured Design.” It allows us to build rigid feature-dependent parts with embedded design intent. It supplies with greater control over future changes. The Structured Design environment includes all of the traditional, powerful multi-body capabilities we know from other MCAD systems, such as 2D sketches, solid features, 3D curves, and surface features that can be combined using Boolean operations. At the end, we can convert the design into an Innovative part for additional flexibility in modifying the design, regardless of the feature order. Going beyond the dual-design environment, I was surprised when I learned about the intelligence given shapes, which are called “IntelliShapes.” These shapes are accessed from catalog browsers. IntelliShapes were amazing to me because of their power and flexibility, along with their extreme ease of use through simple drag-and-drop operations. They can be placed over the surfaces of existing shapes in Scene mode. An IntelliShape can be positive or negative, meaning that it is a solid or a hole (see figure 5). When I drop a positive (solid) on a shape/part, material is added to it; when a negative (hole), then material is removed. After experiencing this over and over again, I’ll never tire of repeating my amazement of how easy this is. Once in place, then I can change their position through many alternatives, including the very nice Triball, and make many modifications through the Sizebox handles. IntelliShapes come from the catalog browser, which segregates them into categories. To start, the categories are Shapes, Advance Shapes, and Tools, but then we can add more, for the browser is totally customizable. This lets us save and organize components according our needs. IntelliShapes have editable parameters, as illustrated by the gear in figure 6. This means that each shape represents dozens or hundreds of variations. A good help to visually repositioning a shape relative to planes shared with a selected face or the shape’s anchor is a SmartSnap feedback on the screen. Beyond the punny title, I found the TriBall interface a great positioning tool due to its versatility, range of application, and ease of use. Although IronCAD has other positioning tools, none is as comprehensive as the TriBall. Sure, similar all-in-one systems can be found in other CAD system, but only this one joins all of them in a single function. 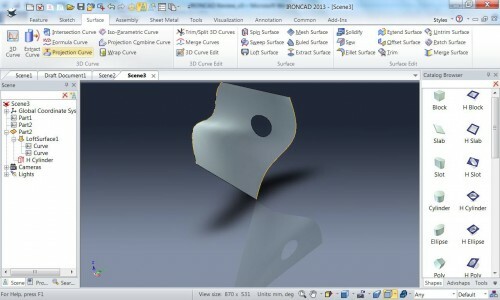 It offers complete repositioning of items such as shapes, attachment points, parts and faces on parts, assemblies, profiles, 2D shapes, and 3D curves. That the TriBall is this mature is no surprise, given that IronCAD invented the interface. IronCAD possesses the complete set of tools that provide all the functions we need for our design work. In addition to solid features, assemblies, Intellishapes, and 3D curves, I can add surfaces, sheet metal and visualization tools. Let me describe these briefly. I can see that IronCAD’s wide range of surfacing tools allows us to create surface shapes from existing edges or 3D curves (see figure 8). It includes surface types like mesh, loft, ruled, spin, and sweep (parallel, fixed, bounded, and two guide curves). Also, there are face-face fillet surfaces, extended surfaces, trimmed and untrimmed surfaces, offset surfaces, and merged surfaces. IronCAD definitely makes available most of the options needed for creating surfaces, without forgetting its conceptual premises of flexibility and easy generation. As I dug into IronCAD, another design alternative I found was sheet metal design. It works in a manner similar to the other design processes in IronCAD. To form an initial sheet metal part, I can drag and drop standard IntelliShapes into a scene. Alternatively, I can create a lofted sheet metal part from existing 2D profiles. Once the basic part is defined, I can continue on to customize and refine the design using visual and precision editing techniques. The sheet metal can be a stand-alone part or be designed in-place with an existing part. I found it has a good level of response, and offers complexity similar to the other products available on the market. Regarding visualization, IronCAD offers a smart set of options for setting the visual style, rendering, realistic and textured. SmartMotions generate animations. I had a pleasant experience in analyzing IronCAD. I found it full of both technical and conceptual surprises. 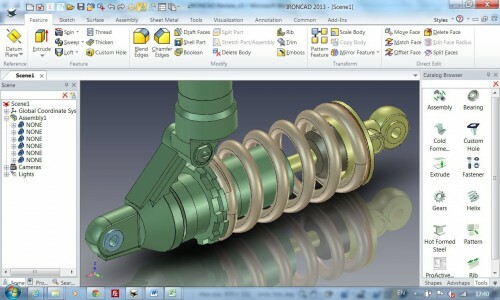 IronCAD has good performance and its flexibility makes the designer’s job easier, faster and dynamic. Thinking in 3D is well supported and implemented. How does IronCAD Solutions achieve this? By using hybrid environments it combines the best of both innovative and the classic structured ones (parametric or direct editing), and also with the application of Intellishapes – intelligent features with great potential and ease of use. This unique tool allows very simple construction of assemblies with a quick positioning of components without going into the complexity of constraints and even takes advantage of automatic positioning, orientation, and sizing. Why I’ve emphasized repeatedly flexibility of this product? Because it permits making direct modeling changes to the products when and where they are needed without modifying the definitions of features in non-affected areas, keeping the original design intact. This also includes the integration with 2D Drawings and its interaction with 3D data. Finally I want to emphasize the great ability that IronCAD has to reuse geometry imported from other native and neutral CAD formats. If these are files imported from Pro /E and NX, it is also possible to maintain the associativity with native data. All this, combined with great visualization and ease of use, allow me to conclude that IronCAD can cover all the needs of a 3D designer.